Birthdays are such a fun holiday, even when it's not your own special day. I love giving creative gifts to friends and family on their birthdays. Once in a while, you meet a new friend or neighbor, or just forget that it's someone's birthday and you need to throw something together last minute without it looking like a last minute gift (we all know the kind). The gift pictured above was around $5. Yours could cost more or less depending on where you shop. If you have no idea what to buy, just stick with the orange theme, and you'll easily come up with a special gift that your birthday friend or loved one will adore! Things like candy, gum, mints, pens, and other orange foods will be the cheapest items, where other items like nail polish or accessories and the tumbler can cost you a little more. A gift bag would be even less expensive for packaging, and would look really cute, too!! 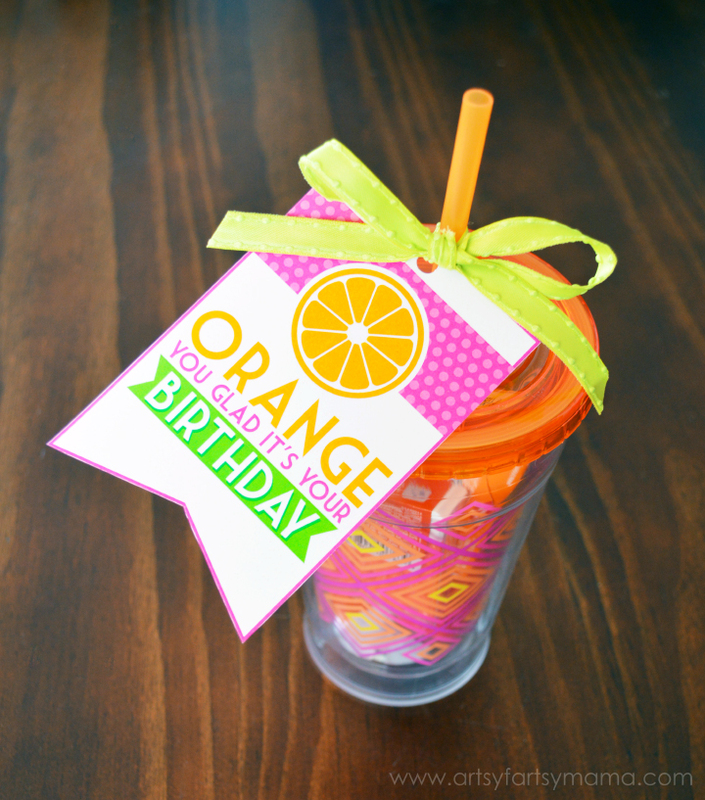 Once you have your gift together, simply download the "Orange You Glad" printable tags below (available in pink or blue), cut, and attach to your gift by punching a hole at the top or sticking it on with tape. Are you ready for some inspiration? Join in on the BLOG HOP! Over 100 talented bloggers have joined with Kristen Duke for her Birthday Celebration Week to share 101+ inexpensive birthday gift ideas with coordinating free printables!! Kristen will sharing birthday tips and giveaways all week on her blog, so be sure to check out her party!! Click on each of links below each collage to see the gift idea and printable closer, along with instructions on how to make them! I like to open a bunch of new tabs, and Pin my favorites for later. Don't forget to follow the Birthday Gift Ideas Pinterest Board as well, to save future great ideas. 10. I Hope Your Birthday is a Whole "Lotto" Fun by C.R.A.F.T. What a cute printable! 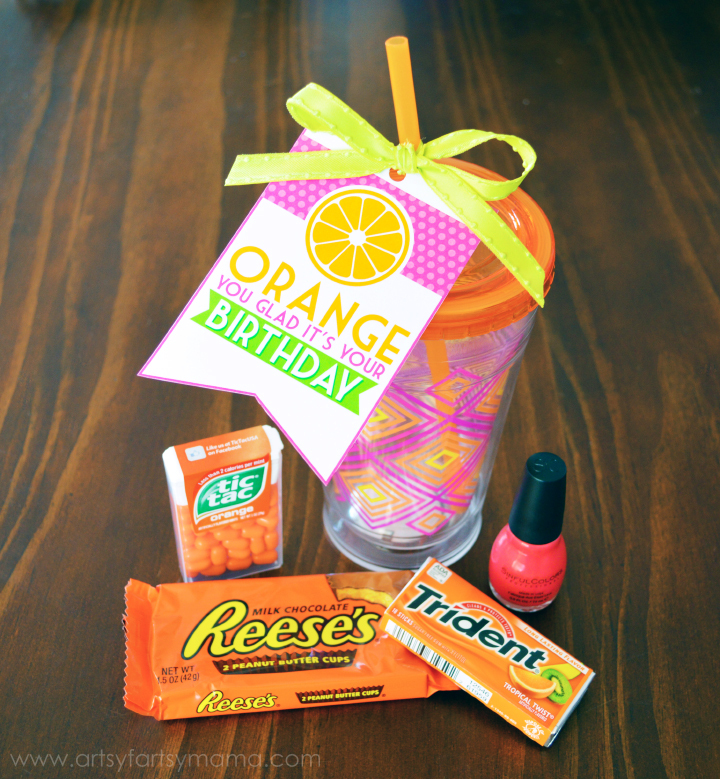 I love this idea and that you can totally customize to other "orange" items you think your friends would like! thanks! Very cute my dear! I love anything orange! I want this for my birthday! Haha, this is such a cute idea, love it! Love this idea. Can easily personalize. Love that I have two colors to pick from! My hubby would love the blue wrapped around a Home Depot card! So great. Thank you for sharing. I just got home from the store-bought all of the stuff to package this up and take it to my friend tonight! I LOVE this idea! My favorite one from the hop! I still laugh every time I see an "orange you glad" line. :p Love this #birthdaygiftidea hop! It made my day extra colourful and delightful.